One of my favorite things about homeschooling is being able to supplement our studies with whatever I feel is important. And for me, that includes cultural history (is that a real word combo, or did I just make it up?). At any rate, teaching my kids about their heritage is super important to me. So is raising them to be responsible members of our global world. So as I mentioned before, we have been working on unit studies to explore culture. Part of each unit is to discover and discuss notable figures (scientists, artists, musicians, authors, etc.). And one of my favorite children's books authors, Monica Brown, helps me to do this on my children's level. I love books that help children to understand - and relate to - important people in history. Monica has already published many books that introduce children to Latinos who have had a significant impact on others: Gabriela Mistral, Dolores Huerta and Cesar Chavez, Pelé, Gabriel García Márquez, Celia Cruz, and others. One of her most recent books is Pablo Neruda: Poet of the People, which brings to life the prolific Chilean author. This book had me from the very beginning when Monica writes: "Once there was a little boy named Neftalí who loved wild things wildly and quiet things quietly." It is beautifully illustrated, and perfectly introduces children to the concept of words as art. Monica's storytelling is at its best. And I think this may, in fact, be one of her best books. 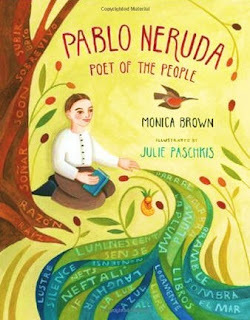 She captures Neruda's love of nature, words, people, and life. And as a teacher, I really appreciate the historical facts that she skillfully weaves into the story. One lucky winner will receive a copy of this book. The deadline to enter is 11:59 EST, Sunday, June5th Thursday, June 9th. The winner will be chosen using Random.org. and contacted via email - so be sure to leave a valid email address in your comment! This giveaway is now closed. Congrats to the Medina family! Disclosure: Henry Holt & Company provided me with a copy of this book after I contacted them and requested one. All thoughts are my own.